Healthy, cool and refreshing, cucumber is all of it and more! 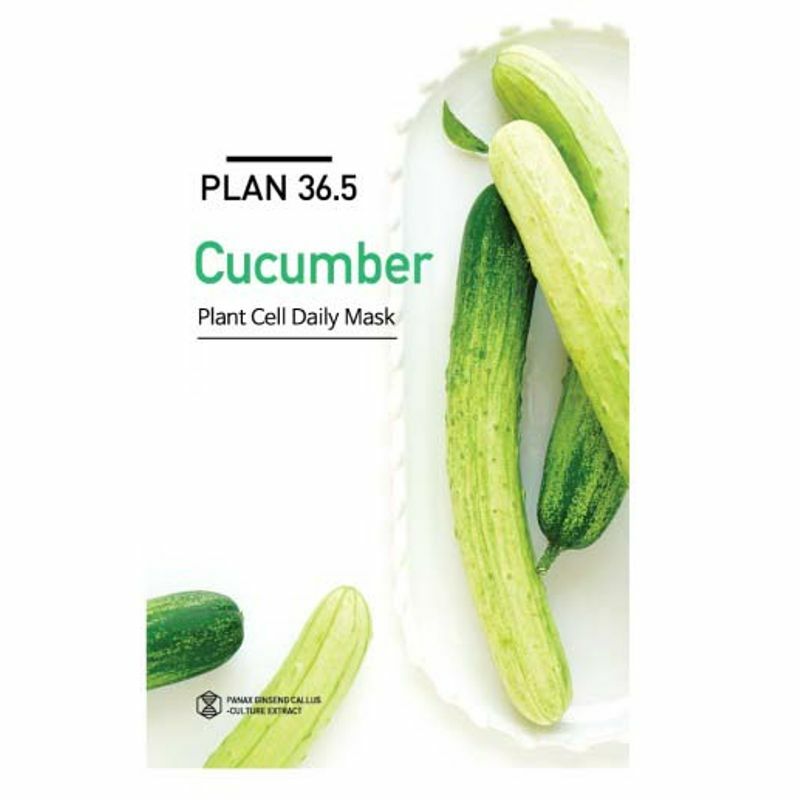 Plan 36.5 Plant Cell Daily Mask Cucumber helps get rid of excess oil and impurities from the skin. This mask tightens the pores, replenishes moisture in the dryer areas of your face and restores pH balance of your skin, while keeping it pure and clean. The actives in this mask get absorbed into the skin without clogging pores and balancing the skin's texture. This cucumber infused mask helps in tightening sagging skin, while keeping it thoroughly hydrated. The Plan 36.5 face masks lend long-lasting moisture and smoothness to your skin. These face masks help keep natural moisture levels at an even balance and improve the condition of your facial skin with the use of plant stem cell ingredients. This essence-rich mask with natural ingredients clarifies, soothes and moisturises skin for a brighter, rejuvenated appearance. About the Brand: Founded in Korea, Plan 36.5 from Nature Factory, uses the world's best nano-technology to make skin care products that are known for their multiple skin benefits. The company has been working on unique and innovative cosmetics and beauty products for more than 20 years using natural ingredients. Explore the entire range of Sheet Masks available on Nykaa. Shop more Plan 36.5 products here.You can browse through the complete world of Plan 36.5 Sheet Masks .